Posted November 14, 2018 by Town Hall Terrace & filed under Grand Island. One of the things we love about Grand Island is that it’s home to many acres of pristine forested land. Trees are an important part of our community’s identity, and now town board is considering the adoption a new law that could earn Grand Island a spot in the Arbor Day Foundation’s Tree City USA program. 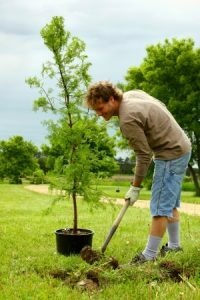 Tree City USA, which includes more than 3,400 towns and cities throughout the nation, was established in 1976 to help communities maintain and expand their trees. Under the terms of the proposed ordinance, property owners who purchase forested parcels of land that are larger than 1.5 acres would be required to apply for a permit from the town before cutting down trees. Such an ordinance is a prerequisite for obtaining a Tree City USA designation for Grand Island. The ordinance would also establish a local subcommittee on trees. Proponents of the tree ordinance argue that it would be minimally disruptive to local citizens and developers, but potentially very beneficial to the health of Grand Island’s trees in the long run. This is because a Tree City USA designation would allow the town to apply for grant money to help with its dead and dying ash trees. In recent years, the invasive Emerald Ash Borer has taken a serious toll on our area’s ash trees. “We see this as a kind of step one of getting to be a Tree City USA,” said Jeff Green, chairman of the Conservation Advisory Board during a recent meeting of the town board. Thanks to the efforts of Green and others on the Conservation Advisory Board, Grand Island could soon have access to the resources it needs to protect its trees for the future.